Data-driven instruction, using tech to develop 21st century skills, and Google’s dominance in the classroom are this year’s top three trends in EdTech, as highlighted by Kahoot! in a recent report. These trends are shaping the way students learn and influencing the way they perform in school. More than ever, educators are aware of just how crucial EdTech is to developing the skills students will need to excel in their future careers. However, educators still face a number of hurdles that limit or prevent EdTech adoption. This is where modern identity access management (IAM) solutions can help: as crucial enablers of technology in the classroom that create a more streamlined, user-friendly, and personalized experience for students, while minimizing teacher frustration and classroom disruptions. Part one of this three-part series explores the significance of these trends, as well as the challenges and barriers to adoption that educators and school districts often face. In parts two and three, we'll dig deeper into how IAM solutions overcome these challenges and facilitate these trends. EdTech enables data-driven instruction where data is used to track student progress and form more effective teaching strategies, so it shouldn’t be entirely surprising that educators are leveraging classroom technologies for this purpose.. What is surprising is the dramatic jump in adoption of data-driven strategies over the past year. Approximately three-quarters of the teachers surveyed by Kahoot! said that they and their school districts have been increasingly using data to improve student performance. Ultimately, the goal of this strategy is to help students develop 21st-century skills through the mindful use of data and technology in the classroom. Periodic assessments, test scores, learning management systems (LMS), and digital tools, such as G Suite for Education, can all be leveraged to gather behavioral and performance data that provides real-time and ongoing insights into student performance throughout the school year. We’re no longer in an age of pen-and-paper assignments or tests. With class sizes growing, teachers must reach more students with the same amount of resources. Data-driven instruction allows them to quickly and easily gather insights on student performance and apply changes and strategies that will have the greatest impact on the most students. Data-driven instruction also stems from a desire to go beyond what standardized testing tells teachers about student performance. Whereas standardized testing doesn’t give educators a sense of what happens in the classroom, data-driven methods provide ongoing feedback on how students are performing, so they can make more informed instructional decisions. The second trend that researchers identified was that teachers are looking for tools that promote creativity and personalized learning to prepare students for life and work in a technology-driven world. Remember the three Rs (reading, writing, arithmetic)? They’ve been joined by the four Cs: collaboration, creativity, critical thinking, and communication. Educators recognize that if young learners don’t develop these crucial skills today, they won’t flourish in the jobs of tomorrow. The introduction of technology has turned the classroom into a place not just for lectures, but also for practice, more individualized instruction, and group problem solving. The Kahoot! 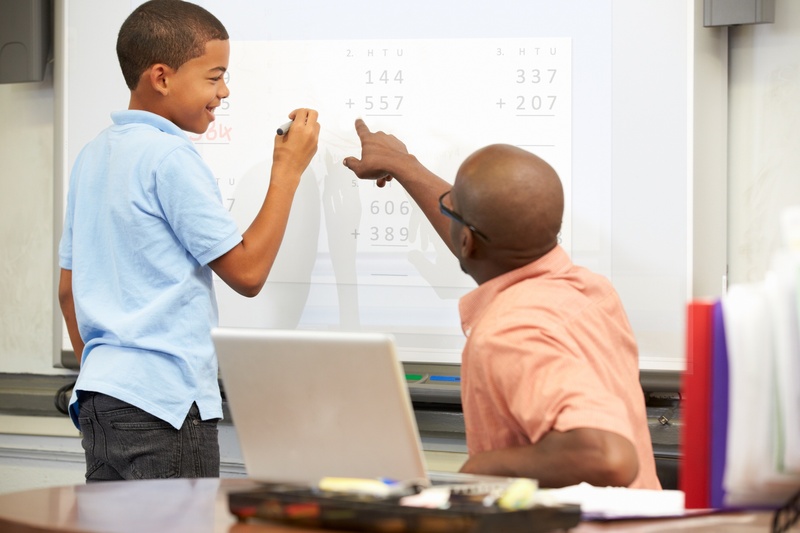 study found that teachers are leveraging technology to develop 21st-century skills using a number of methods, such as having students work in teams and collaborate on projects (66 percent), promoting the use of tech tools for project-based learning (58 percent), encouraging creative thinking (55 percent), and honing their students’ independent thinking and problem-solving skills (54 percent). To bolster the use of technology in the classroom, schools purchased more than 23 million devices for classroom use during the 2013-14 academic year. One-to-one device initiatives and bring-your-own-device (BYOD) programs are becoming increasingly popular. When students can access their resources from anywhere, it gives them the ability to work at their own pace and provides them with better support outside of the classroom. When it comes to EdTech, Google is king. The tech giant has enormous sway over the EdTech hardware and software markets. According to Google, more than 30 million students in the United States, or more than half of K-12 students, use Google apps. According to Hal Friedlander, former CIO of the New York City Department of Education, between 2012 and 2017 Google went from being an "interesting possibility" to the "dominant way" that U.S. schools teach students how to research, create, and submit their school assignments. “Google established itself as a fact in schools,” said Friedlander. 43 percent of those surveyed use Chromebooks for instruction. 53 percent of survey respondents said Google Classroom is their LMS of choice. 53 percent of teachers surveyed said the Chrome operating system was the OS most frequently used in their classroom or school. So, why does Google continue to have such sway in the EdTech space? For starters, G Suite for Education offers low-cost laptops and free apps that are very appealing to school districts. When other tech companies ignored K-12 education, Google saw a tremendous, untapped opportunity. To cater to shrinking budgets, the company released affordable Chromebooks equipped with an easy-to-use OS and free resources for students and teachers. Google’s EdTech also centers on enabling productivity and collaboration—both of which are key to developing 21st-century learning skills. With cloud-based apps, students can access their work no matter where they are or what device they’re using. G Suite for Education encourages open communication and collaboration as well, making homework more enjoyable and easier to do. G Suite enables collaboration in a way that Microsoft Office does not. Instead of emailing files back and forth, students and teachers can edit documents together, in real time. There are benefits for educators as well. Teachers can utilize G Suite for Education to distribute and track assignments and provide grades and feedback in real time. Google’s ability to automate data collection makes it simple to put data-driven instruction into practice by offering increased visibility and ongoing insights into student performance. And finally, G Suite’s Google Admin console gives teachers centralized control over device management, user enrollment, and software upgrades. The first takeaway is that teachers recognize the critical role that EdTech plays in student performance and in preparing their pupils for the future. Data-driven instruction and solutions, such as Google hardware and software, play a role in developing 21st-century learning skills. However, there are still major roadblocks to making teachers’ hopes for their students materialize, which leads us to the second takeaway: Teachers want to do more, but they don’t have the resources to do so. Half of all teachers struggle with a lack of funding from their school or district. Many times, teachers are left personally footing the bill in order to bring EdTech into the classroom. The Kahoot! survey found that one in four teachers have paid for EdTech solutions out of their own pockets. Budget constraints also mean training isn’t available for teachers to learn how to use EdTech effectively. And without proper training, educators end up wasting time trying to figure out how to use the tools on their own and grappling with issues such as student login problems. In the end, EdTech tools can often become more of a burden than a help. Teachers very much want, and need, a streamlined, simple, user-friendly EdTech experience. The top EdTech trends make it obvious that technology is crucial to providing students with a personalized, collaborative, and productive educational experience that better equips them with the 21st-century skills they’ll need to succeed in their future careers. That said, there are significant hurdles to EdTech implementation, such as budget restraints and implementation challenges. Even when successfully adopted, EdTech can be user-”unfriendly.” Issues such as helping students locate resources and resolving login issues waste valuable class time and lead to user frustration. But EdTech doesn’t have to come with such challenges. IAM solutions can help teachers, schools, and districts overcome many of these obstacles by making educational technology more user-friendly, affordable, and personalized. Stay tuned for part two and part three of this series, in which we explore how IAM solutions deliver these benefits.